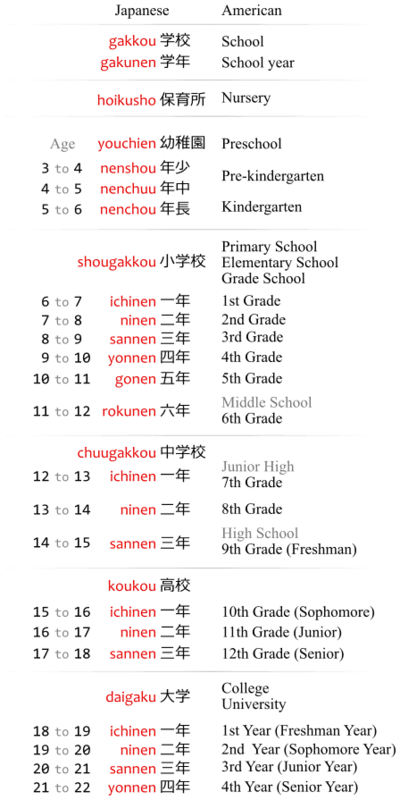 For reference, a list Japanese school years, grades, and the ages characters attend school in anime. Including terms like shougakkou ichinen 小学校一年,.chuugakkou sannen 中学校三年, koukou ichinen 高校一年 and so on. To begin with, the Japanese school system, much like the rest of the world, works by grades which are associated to years. Soon this school year ends. Not that the numbers can be written with kanji (一二三四五) or Arabic digits (１２３４５). You can create words for students of a given year by adding the suffix sei 生 to the year words. For example: ichinen-sei 一年生 is an ichinen student, a "first year student." Also works for ninensei, sannensei, etc. Class. A class of students. The hoikuen 保育園 isn't really a "school" but a place that takes care of babies and children under 6 years old for their parents. In Japanese, the word hoikuen means "nursing," hoiku 保育, "garden," en 園. A nursing garden. A nursery, or nursing school. There are many reasons for children to be placed in a hoikuen: both parents work, no babysitter, the stay-at-home parent was hospitalized, etc. At three years old a child can go to an optional preschool, and at six years old they have to go to grade school, so normally a hoikuen doesn't have children under 6. As one would expect, hoikuen are kind of rare in anime. 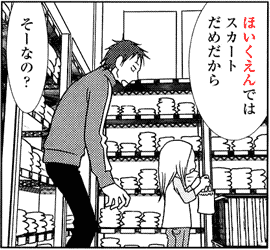 Context: a guy is buying clothes for his aunt, who's a 6 year old girl, when he questions why she's not picking skirts. Because in the nursery school, [you can't wear] skirts. Written with hiragana instead of kanji because children can't speak kanji. Not good. Not allowed. Forbidden. Etc. Same thing as sou そう. The term hoikusho 保育所, literally "nursing place," is synonymous with hoikuen 保育園. The only difference is that hoikusho is the official name found in laws, etc., while hoikuen is the popular name, frequently added to the names of such nursing schools. The youchien 幼稚園 is a school for children ages ranging from 3 years old to 5 years old. In Japanese, the word youchien means "infancy," youchi 幼稚, "garden," en 園. Infancy garden. A garden for infants. A kindergarten. Note, however, that in the Unites States the term kindergarten refers to the first year of elementary school (which would be the last year of a youchien). The first two years of youchien would be equivalent to preschool or pre-kindergarten in the US. Ages 3 to 4. Preschool, pre-kindergarten in the US. Ages 4 to 5. Preschool, pre-kindergarten in the US. Ages 5 to 6. Kindergarten in the US. The shougakkou 小学校 in Japan would be equivalent to an "elementary school," "primary school," or "grade school" in the United States from first grade and up. A student of a shougakkou is a shougakusei 小学生. In Japanese, the word shougakkou means "small," shou 小, "school," gakkou 学校. Small school. Sometimes, shougakkou is abbreviated to shougaku 小学. Ages 6 to 7. Same as first grade in the USA. Ages 7 to 8. Same as second grade in the USA. Ages 8 to 9. Same as third grade in the USA. Ages 9 to 10. Same as fourth grade in the USA. Ages 10 to 11. Same as fifth grade in the USA. Ages 11 to 12. Same as sixth grade in the USA. The chuugakkou 中学校 in Japan has no real equivalent in the United States school system. This is because it starts at the same time as "middle school," however, in the US "middle school" is sometimes called "junior high school" instead. Most notably, the last year of chuugakkou is equivalent to the freshman year (first year) of high school in the US. A student of a chuugakkou is a chuugakusei 中学生. The word chuugakkou means "middle," chuu 中, "school," gakkou 学校. Middle school. Sometimes, chuugakkou is abbreviated to chuugaku 中学. Ages 12 to 13. Same as seventh grade in the USA; first year of middle school or junior high. Ages 13 to 14. Same the eighth grade in the USA; second year of middle school or junior high. Ages 14 to 15. Same as the ninth grade in the USA; high school freshman or first year. The koukou 高校 in Japan is equivalent to the last three years of high school in the United States. A student of a koukou is a koukousei 高校生. You may have noticed that, unlike shougakkou and chuugakkou, the word koukou has no gakkou in it. This is because the word koukou is an abbreviation of koutou gakkou 高等学校. Despite being an abbreviation, koukou is used with more frequency than koutou gakkou in anime. The word koutou gakkou means "high grade," koutou 高等, "school," gakkou 学校. High-grade school. High school. Ages 15 to 16. Same as tenth grade in the USA; high school sophomore or second year. Ages 16 to 17. Same the eleventh grade in the USA; high school junior or third year..
Ages 17 to 18. Same as the twelfth grade in the USA; high school senior or fourth year. A daigaku 大学 in Japan is any post-secondary school, this includes universities, colleges, etc. A student of a daigaku is a daigakusei 大学生. The word daigaku means "large" or "big," dai 大, "education," gaku 学. Large education. One would think that since shougaku and chuugaku are abbreviations of shougakkou and chuugakkou, daigaku ought to be an abbreviation of daigakkou, right? The word daigaku is not an abbreviation of daigakkou. The word daigaku as-is is the word the education officials of Japan chose for post-secondary education. And, yes, the naming is a mess. Nobody is saying it makes sense. I just want to note if a school calls itself a daigakkou, "big school," they aren't necessarily an actual daigaku, "college." These words are not the same thing. College first year. University first year. Besides the schools above there are other types of schools that should be taken note of. A koutou senmon gakkou is a mix of high-school and college. A technical college. While the normal koutou gakkou (koukou) has three school years, a koutou senmon gakkou has five school years. You'd start it at 15 or 16 years old (just like in a koukou), but finish it 19 or 20 years old. The words koutou senmon gakkou mean "high-grade," koutou 高等, "specialty," 専門, "school," gakkou 学校. A high school to create specialists, technicians. A tanki daigaku is a college with fewer years than normal. It's equivalent to "junior college" in the united states. While the average daigaku course takes four years to complete, a tanki daigaku takes only two or three years. The words tanki daigaku mean "short," tan 短, "term," ki 期, "university," daigaku 大学. A short term college or university. An ika daigaku is a "medical college." As one would expected, a course in medicine is harder than your average course, and take longer to complete. Because of that, an ika daigaku usually takes six years to graduate from, compared to the four years of the average college. The graduate would have at least 23 or 24 years old. The words ika daigaku mean "medical science," ika 医科, "school," gakkou 大学. Medical science school. Medicine school.